Dozens were killed when this Soviet-era Russian-made plane crashed in Iran in January. (CNN) -- Iran's transportation minister says the Islamic republic is sending home Russian pilots who fly for Iranian airlines, according to local reports. "Sending back the foreign pilots is on the agenda of the ministry of road and transportation and the issue is being implemented now," Transportation Minister Hamid Behbahani told the semi-official Fars News Agency on Monday. Behbahani added the Russian-made Tupolev 154 planes -- Soviet-era aircraft operated by several Iranian airlines -- will gradually be replaced by newer passenger planes. It was not immediately who would supply the new planes. In March, Iranian President Mahmoud Ahmadinejad issued an order to expel the foreign pilots within a two-month time period. Following that announcement, Behbahani said Iran should not employ foreign pilots when there are enough skilled Iranian pilots, Fars reported. The report did not say how many Russian pilots are flying in Iran, or how many Tupolevs are in operation in the country. Iran has a recent history of plane crashes and mishaps with Russian-made Tupolevs. Most recently, 46 people were injured in January when a Taban Air plane caught fire after landing at Mashhad International Airport in eastern Iran. 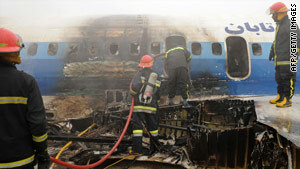 In 2009, a Caspian Airlines flight crashed in a field near the northern city of Qavzin, killing more than 160 people. The Tupolev 154 is essentially banned in the West because it does not comply with European noise and pollution regulations, but it has a safer-than-average accident record, aviation safety experts told CNN after the Caspian crash.